westward to the Gulch. 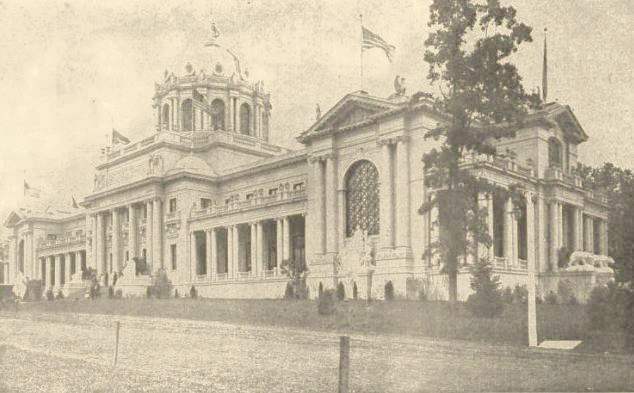 resembling a hunting lodge, the structure was 140 by 68 feet, and cost 22,361.40 dollars and builders used timber from Maine forests, built in Maine, it was taken apart in pieces and reconstructed in St. Louis by Maine woodmen out the aid of nails. The summer resorts of the Main Coast were shown in window transparencies. An information bureau was situated inside the building. building were hung with pictures of various scenes in the State. 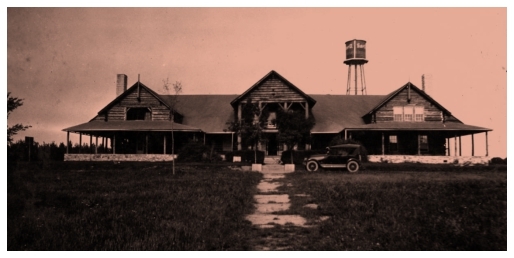 After the Fair, it was purchased by a group of Ozarks for 2,000 dollars for the purpose of a sportsman's clubhouse, later becoming an Ozark school before burning down to the ground in the 1940s. Dobyns Hall at the School of the Ozarks in Point Lookout. 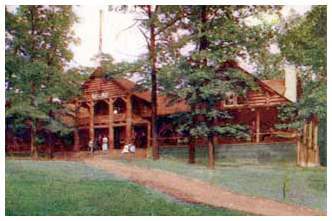 Log building was formerly the Maine State Buiulding, moved from the 1904 St. Louis World's Fair.